This was an evening of 8 short plays very much in the style of a J B Shorts evening, performed on a mostly bare stage with a minimum of set, props and costuming, meaning that the turnaround between plays was swift and efficient. 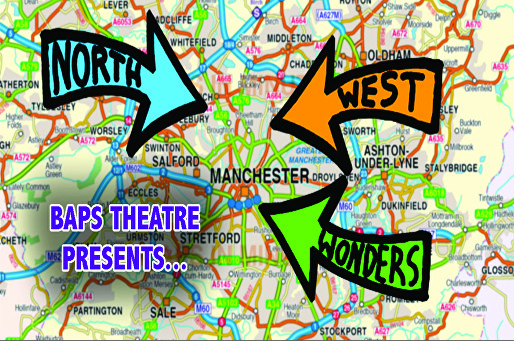 This though was Baps Theatre; a company run by three actresses living and working in Greater Manchester, and this was their paean to the creativity and talent of the North West of England. All the writers, directors and actors in the 8 plays we saw all haled from the region, and proved beyond doubt that this region is teeming with talent. The evening starts with a wake, with the family gathering round the coffin in the living room and ends with Baps's own Sophie Ellicott and Louise Wilson in a comedic two-hander which sees the spiritualist 'help' one of her clients quite accidentally. Surprisingly though for an evening such as this, there was much more drama and pathos than real comedy; not that that was a bad thing, on the contrary, it worked well and there really was something for everyone in the chosen plays. The evening felt a little long; in fact wasn't over until 10:15pm, which did slightly put a damper on the euphoria, but otherwise the plays and the production as a whole was a resounding success. Obviously when there is such an eclectic mix of writing and performing styles, some plays are going to appeal to some people much more than others, and for me there were three stand-out pieces. The first of these came at the end of the first act, and was a beautifully observed and hilarious look at modern healthy society through the eyes of two burly workmen, called 'Tea For Two' by Joe West and beautifully directed by Emma Bird. The two workmen Simon and Gary were given a enjoyably real and empathetic lease of life by Leo Arkin and Paul Wilson. The second half was definitely better and slicker than the first in general, and also had my other two favourite plays in there. 'Constitutional' by Ian Gray was a superbly written and excellently measured monologue portrayal of an elderly widower sitting in his living room and telling a story of when he went for a walk by the lake and saw a young female decomposing dead body in the bushes. This gentle comedy takes you wonderfully on this journey with him, and yet all the time we never really quite know whether or not he is actually talking to real people or hallucinating, such was the genius of the writing. Even at the very end, a superb tag-line, we were still not sure of either his mental state or his culpability. Royston Mayoh's sensitive and human portrayal of early-stage dementia was utterly realistic, and combined with excellent direction by John Tueart this was the best play of the evening. Finally my third favourite came from the pen of Jayne Marshall, who confesses not to be very comfortable when writing comedy and yet all the plays I have thus far seen of hers, and I've seen quite a few, have elements of wonderfully measured and observed comedy in them. This play, 'Common Ground' was no exception. We see Sarah (Sophie Tolland) waiting at Manchester airport baggage claim for her suitcase which has been lost en route from Spain. She is obviously upset as she comfort drinks and eats, and then, as she decides that this is the right moment for her latest vlog she starts telling the camera perhaps a little more than she would have done had she not been emotionally disturbed. Again, superb acting from Sophie and tight directing by Patrick McConnell made this piece immensely watchable and relatable. One thing I will say though in general was that during some of the plays I had difficulty in hearing. I wasn't the only one to remark on this either. The theatre at 53Two is not a large one, and projecting a voice to the back of their auditorium is by no means a big ask; however, it seemed that several of this evening's cast were unable to do so, and as such I missed some of the quieter sections of speech. That was such a shame, when the evening was so well put together and produced in every other respect.